So this week's Scribble Picnic's theme is Fill In The Blank (follow the link to see other artist's interpretations or to join! )...and this is the idea we were given...to fill in the negative space. Beautiful macabre mind you have, great take on the theme Rain! And those are spooky heads indeed! Those heads sure could be pretty spooky in the middle of the night. Love your painting - perfect way to fill in the blank. Those heads are creepy! LOL Great for displaying hats and things though. Great fun with the theme and "scribbles!" Great painting! It's the plastic wrapping on those heads that makes them uber-creepy! Love that your new hats will be 'displayed' rather than hidden a closet - they will make a really unique collection (and yes, it's the plastic I think which is making the heads so spooky! Perhaps leave them like this as part of your Halloween decor - really quite scary. Great painting to 'fill in the blank'. I agree with Mary, the plastic makes the heads scary. 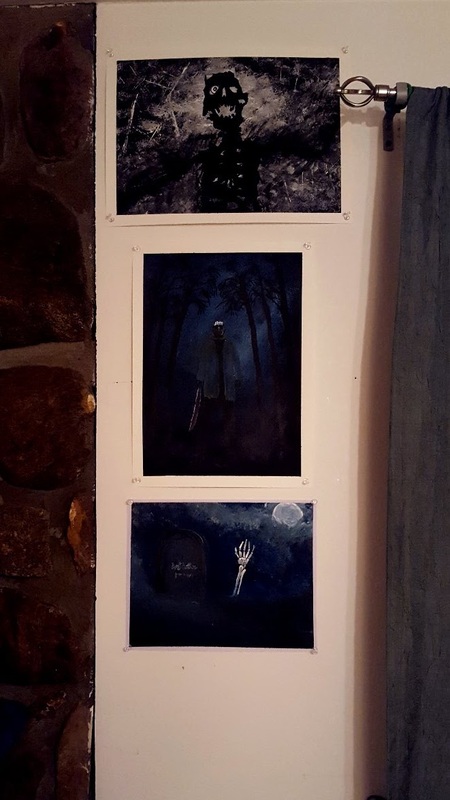 Your art is wonderfully spooky too! What a great imagination you have, Rain! I sat and looked and looked at the sketch from which to get an idea and came up with . . . nothing! (I have always suspected my sense of imagination is severely lacking.) Please do keep painting regularly. Each piece you do gets better and better. As for those heads . . . I'm surprised they haven't scared the animals! Nice....I keep meaning to do something for this group and I keep forgetting. This time I did it but forgot to post...haha. Yes, the heads are definitely spooky! Especially a whole group of them. I love your paintings...really...is there anything you aren't good at? You have more talent in your little finger than I have in my entire body! Love seeing your art work. I think I would use one of those heads to make a "no trespassing" display on the back of my property. Then maybe people would quit coming in off the national forest and cutting down my maple trees to sell to the saw mill in Murphy, NC. I like your Halloween art, Rain. I put some halloween/fall ferret paintings on my blog, but I didn't do them. They are done by an artist friend of mine who lets me post them, named Stef. Looks like all is going well up there. Love your graveyard scene! Spooky! As for the heads...I'd paint them and bury them partially in the garden haha. You could have so much fun with those! You must have a LOT of hats.....I keep my few in my hatboxes. Then use the hatboxes for decorations. spooky heads. 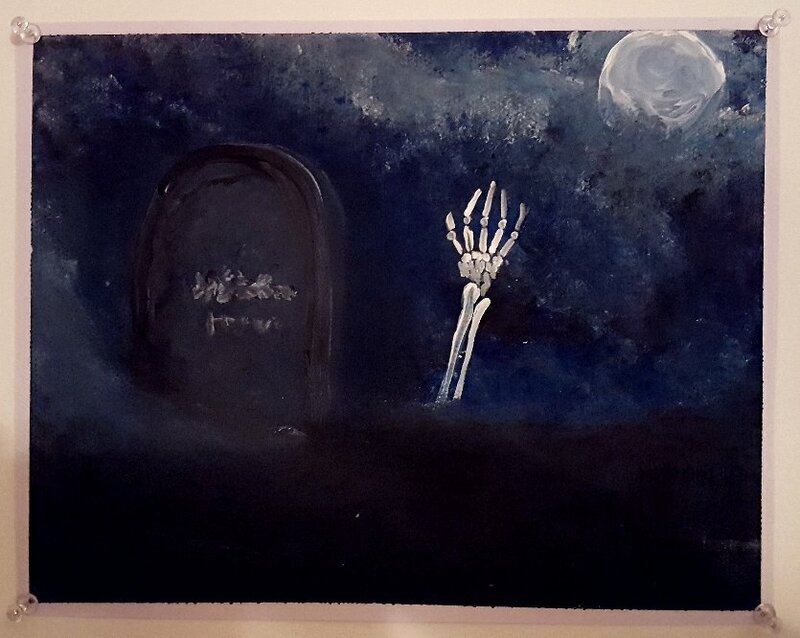 spooky painting. is it halloween already? Oooh, I'm not at all sure about those heads! Too spooky for me! Thanks Lorraine :) I did get a bit of a scare with the heads the other morning! Thanks Leigh :) I'm really enjoying the scribbles, it's giving me some structure so I don't get lazy with the painting! Thank you RO :) I think it reminds me of the movie "I Know What You Did Last Summer"...there was a scene where the "beauty queen" was locked in a garment store with all of these mannequins...it was pretty scary! Thank you Debra :) Yes, the plastic really makes them look creepy! Hi Mama Pea :)) Thanks! My imagination is a little off beat I guess, but I love it! Oh, the dogs paid no attention to the heads...the cats just wanted the plastic on them to play with lol...I'm the one who is more freaked out by them! Thanks Harry :) Things are settling in. We have a few "rebels"...we've found over the years that when we introduce new pets to the gang, there is always one of them that tries to get away with anything they can lol...we say they are going through their "terrible two's" like the toddlers do when they start feeling independence ha ha. But yes, things are going well. I love your friend Stef's art, it's really nice, especially those Halloween ones you posted! Hi Lissa :) Halloween is the entire month of October here for us! Thank you Martha :)) I love and fear my heads ha ha ha....some of them have really shocked-looking faces...I wonder what happened during the shipping lol! Hi Nik :) Yeah, we are starting to get some nice hats and we really want to keep them out and not hidden in boxes! I LOVE your take on the prompt, Rain! Spooky heads and spooky art...perfect for Halloween. Wow, all three of those are amazingly done, Rain! i love them and yes, super spooky! Very clever take there with the skeleton for the line(s). Perfect. I'm only now visiting some people to get word out too that I have updated the themes finally but still need to reply to comments and visit everyone else. Thank you so much for this delicious...or errr...bony treat! Any, yup, those heads would utterly terrify me!! Looking forward to seeing your Boo too. BTW, you would have loved our Cosplay we jsut did last weekend. We were vintage French 1930's clowns--Pierrots. Made our own costumes and did our own makeup too. It was a total hoot. We are doing Venetian carnival costumes for halloween and will jsut walk around downtown neither of us are terribly into partying and such. We won third place on the Pierrots though!